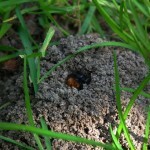 Some of our solitary bees nest in groups or aggregations. This scheme was launched in 2017 and aims to monitor those nest sites. It asks participants to count the number of active nest holes once a year. You can monitor any species you are able to identify, but it is most likely to apply to Andrena cineraria, Andrena fulva, Osmia rufa (now O. bicornis) & Halictus rubicundus. Don’t worry if your nesting area contains more than one species, we just ask that you estimate the total number of nesting holes and roughly estimate those belonging to each species. The true value of these data are in the longer term trends that they will provide. If annual counts are carried out on the nesting areas into the future it will provide early warning signs of threats and will help track changes in wild pollinators over time. It will also help improve the accuracy of future conservation assessments of the species. It is the intention of the Data Centre that this is a longer term data stream to support solitary bee conservation in Ireland. 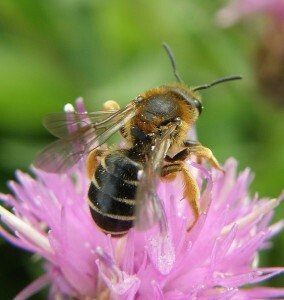 In reality, we know very little about solitary bee nesting ecology in Ireland. An added bonus of this scheme is that it helps improve our knowledge on nesting requirements. Andrena cineraria (Grey mining bee) is a mining bee that burrows into bare soil, often on south-east facing slopes. It’s flight period is from late March until June. You should count the active nest holes when your colony is at its peak. This is most likely to be in late April. 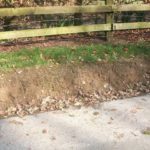 You will know a hole is active if you see a bee using it or if you see a little pile of fine substrate at the entrance where the excavated soil has been deposited. You should count the active nest holes when your colony is at its peak. This is most likely to be in early-mid April. 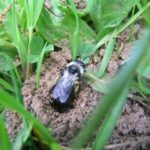 You will know a hole is active if you see a bee using it or if you see a little volcano-like mount at the entrance where the excavated soil has been deposited. 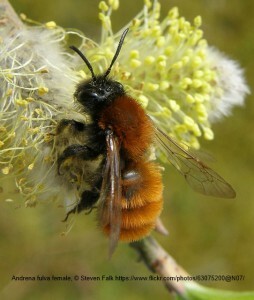 Osmia rufa (Red mason bee) is a cavity nesting solitary bee. 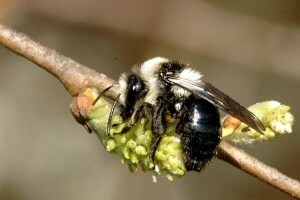 It nests in existing holes in wood, cavities in soft mortar or in bee nest boxes. It’s flight period is from April to June. It is a relatively recent arrival in Ireland and is more commonly observed in cities where suitable nest sites are more likely to occur. You should count the active nest holes when your colony reaches the end of its flight period. This is most likely to be in June. You will know if a nest hole is active if it has been closed with a mud plug at the end of the season. This encases the larvae who safely spend the winter as fully-formed bees within tough cocoons. 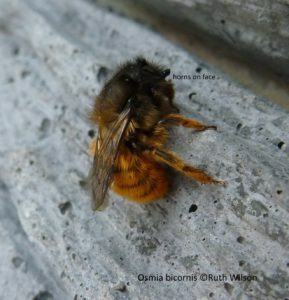 Osmia rufa is easiest to monitor if it is using a deliberately placed bee nesting box or hotel. Alternatively, you can count the number of nests being visited by the bees when the colony is at it’s peak. Halictus rubicudus burrows into bare soil, either on flat ground or on south-east facing slopes. It can sometimes occur in huge aggregations. The species is eusocial, with queens emerging from hibernation in April, workers present from May onwards and males and new females from July to early October. It is more difficult to monitor, but you should attempt to count the active nest holes when it is at its peak. You can choose when to do this but it should be at a similar time each year. Active nest holes will be ones that you observe bees using.